The Apple Chronicles, Part 1: Applesauce – I'll Make It Myself! One of my favorite apples grown in Japan is the Jonagold. The flesh is crisp and sweet, and the skin is a gorgeous gradation of reds and yellows. This week, however, I have been pushed to the culinary limit by my love of a good deal. 1 crate of apples for 980 yen. 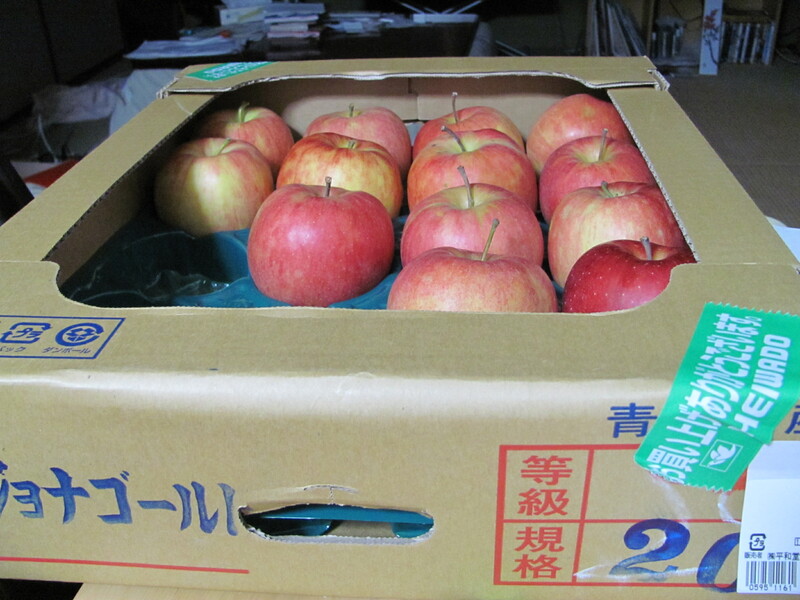 That’s right, 20 beautiful grade-A Jonagolds from the apple country of Aomori for 980 yen. That’s 49 yen PER APPLE, and these are big apples at 270 grams each! My head nearly exploded from the glorious savings. 1 woman who lives alone + 1 tiny Japanese refrigerator/freezer VS. 5.4 kilos of apples. If I were home in the States, I could have easily frozen most of these, but my freezer is perpetually full of extra food and hoarded rye bread, so I can only freeze a few due to space issues. Add to this the fact that I am leaving on holiday for part of Golden Week, and the plot thickens. Failure is not an option, my friends! Join me on my 20-Apples Challenge! 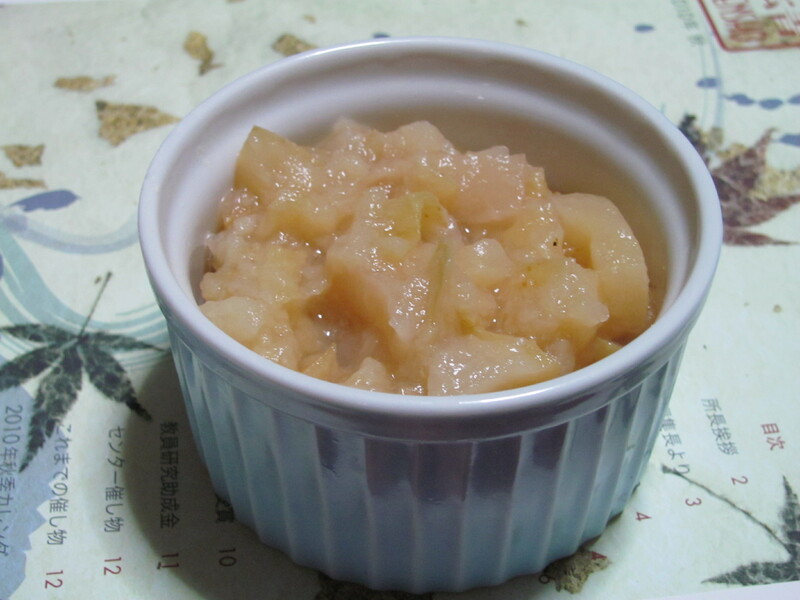 The most obvious way to use up a lot of apples is to make applesauce, which I use for baking and just to eat. Since it freezes well and can be frozen flat in a freezer bag, it’s a practical choice for my ridiculously small freezer. The apples will give off their juices as the cook, so you don’t have to worry about burning them as they cook down. If you like smooth applesauce, peel and dice the apple and consider using a blender afterward; if you prefer chunky applesauce, leave the peel on and/or cut the pieces a bit larger. This time, I peeled the apples but then cut up the peel itself and added it, too–the apples cooked much faster in general, and the applesauce has the consistency I prefer. 1. Pour enough water into a large pot so that the bottom is covered. 2. Optional: Peel the apples for a smoother consistency. (May add in the diced peel as well for an in-between consistency). 3. Dice the apples and place in the water. 3. Put the pot on the stove and cover with a lid. Cook over medium heat (boiling is fine) until the apples are very soft, about 20-30 minutes. Turn off heat. 4. Mash with a potato-masher or a fork until the applesauce reaches the desired consistency. For very smooth applesauce, run it through a blender in batches. 5. Add cinnamon (or any other spices) and stir well. 6. Let cool. Store in an airtight container in the refrigerator for up to one week. Applesauce can be frozen in a freezer bag or freezer-safe glass or plastic containers for up to a year. To thaw, just set in the refrigerator for a few days. *These apples weigh 270 grams a piece. Jonathan apples (Koujoku, 紅玉 ), or Fuji (ふじ, 富士) are also good. Pingback: The Apple Chronicles, Part 2: Kabocha-Apple Whole-Wheat Turnovers Sage and Thyme « I'll Make It Myself! Pingback: The Apple Chronicles, Part 2: Kabocha-Apple Whole-Wheat Turnovers « I'll Make It Myself! Pingback: Tricks of the Trade: Oatmeal Banana Bread « I'll Make It Myself! Pingback: The Jam of Oppression? : Feminism, “New Domesticity,” and Gender-Neutral Home Cooking | I'll Make It Myself! Pingback: The Great Game Cake (BBC Sherlock) | I'll Make It Myself!